A few days ago I celebrated my tenth time running the half marathon in Gothenburg in Sweden called “Göteborgsvarvet“. 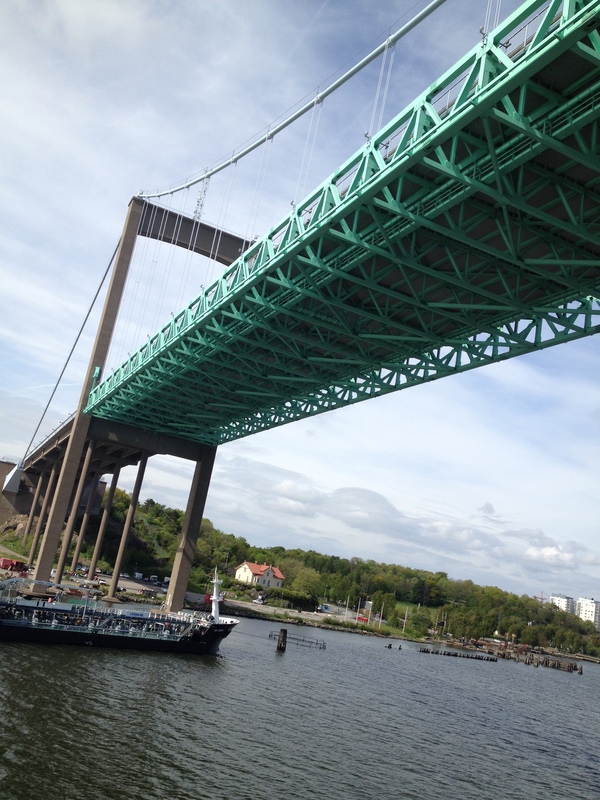 We run on this bridge over the river at Gothenburg. It’s the world’s biggest race of this kind and it’s an occasion to study the things you don’t see at home. Standing in the toilet queue I was right behind a couple who really appreciated each other. They kept close and whispered things. As I looked discreetly I saw that both had severe deformities in their faces. The woman’s voice came from her with big difficulty. I think the young woman was born with these handicaps and the man had been in a terrible accident that had him go through various plastic surgeries. They wore the finest running equipment and a photographer came slowly down the queue to take photos. I liked that he didn’t discriminate them, but took a quick shot as he did for me a moment later. I felt the tears pressing on my eyes thinking about the sufferings they had gone through, and the joy of finding each other. The same morning I had been so upset realising that I had left a bag of new running gear in a food shop in the evening having been distracted by the self-service check out desk. Of course we went back to the shop first thing after breakfast, but it had not been found. I could buy it once again just to get over the pain of losing it, but these people had not a chance to look beautiful in a classic way. But really they were beautiful in their harmonious love for each other. The day ended at a very fine restaurant where we usually celebrate the completion of the race. This had been the best result ever having followed the training suggestions of the Endomondo App. This means a lot more training than I could ever just do without the help of the app. The training has consisted of four training passes a week of different lengths and interval training( meaning more speed), and Cooper tests once a month for more than 6 months. In a Cooper test you run as fast as you can in 12 minutes after a short warm up. It sounds easy but it’s not. It was worth the effort and have given me the hope that age don’t pull you back automatically. Just before leaving the restaurant, I saw a gentleman with a haircut, that gave me chills all over. In a way he was beautiful in a very classical manner and it was impossible not to look. The hair cut very tight along a line over the ears and on the top of the head you see a little more hair. But the haircut was a kind we would never see in Denmark because during the war the German oppressors would most likely have this kind of well cut hairstyle. I know that this man is completely innocent and has nothing to do with the Nazis, but how could he choose the hair cut? That’s a puzzle to me. Maybe the Swedes are just more Avant-garde in their hairstyles than we are in Denmark, and 70 years has passed since the war ended. To end the issue of hairstyles I saw a young man in the tram with a French plait or braid. It looked really good on him! Now the race is over and I have no hurts and injuries and I will start again tonight with a new running plan for half marathons in the autumn. I went back to the supermarket to ask once more for the lost bag and to my big joy they had it this time. So now have a set to give to a friend as I bought it all again at the big Expo at the stadium. Gothenburg has many attractions one of them is their Botanical Garden just opposite the stadium where the race is held. you describe the scene so well. Running is a discipline as writing is. I went to a Seattle writers conference and met an engineer who became a writer after she lost her hands and half her legs in an accident. Oh how tragic. How did she do to be able to write?